In February the Smithsonian’s National Museum of the American Indian announced the five finalists chosen from 120 submissions in a design competition for the National Native American Veterans Memorial. The five designs are the work of James Dinh, Daniel SaSuWeh Jones (Ponca) and Enoch Kelly Haney (Seminole), Harvey Pratt (Cheyenne/Arapaho), Stefanie Rocknak, and Leroy Transfield (M?ori: Ngai Tahu/Ngati Toa). The finalists will advance to the second stage of the design competition. The designers presented their initial concepts at a public event held at the museum on February 7. The event was webcast and may be seen here. The winning design will be announced on July 4. 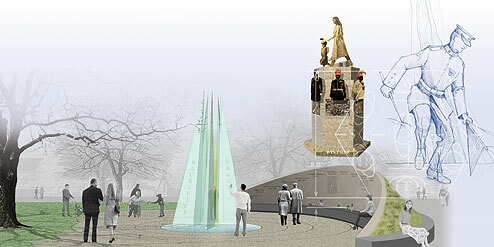 The memorial is scheduled to be dedicated on the grounds of the museum in 2020. For a look at the long history of the memorial, see William Triplett’s feature articles, “Forging a Vision: The National Native American Veterans Memorial” (November/December 2017) and “Left Behind: Honoring Native American Veterans” (July/August 2013).